Judge Alsup from the patent-heavy Northern District of California court has taken advantage of the almost certain appeal of patent cases by writing an “Appendix” to point out what he perceives as an unfairness in patent jurisprudence. He asks the Federal Circuit to address the burden of proof in swearing behind references. 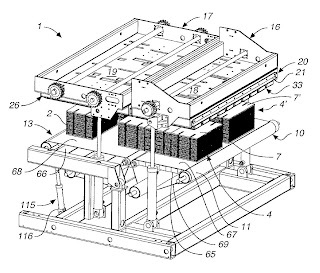 The patent in suit was for an improvement in bundle breakers, which are machines that break stacked sheets of materials along scored lines, like for cardboard boxes. By the plaintiff’s admission an existing machine had every limitation of the patent, so the only question was whether the machine was prior art. It was sold in June, 2002 and the patent application was filed on August 28, 2002, so the patent owner had to come forward with evidence demonstrating that the inventor conceived of the patented invention before June, 2002. The court ultimately held that the patent was invalid for obviousness based on other references. It took the opportunity, though, to comment on the burden of proof for swearing behind a reference. The court was clearly troubled by the amount of evidence that the plaintiff was able to rely on for swearing behind the earlier machine, just a lab notebook and oral evidence (presumably from the person who kept the lab notebook). When the invention date is due to be carried back beyond his application, courts regard the effort with great jealousy, and must be persuaded with certainty which is seldom demanded elsewhere; quite as absolute as in a criminal case, in practice perhaps even more so. United Shoe Mach. Corp. v. Brooklyn Wood Heel Corp., 77 F.2d 263, 264 (2nd Cir. 1935). (As an aside, this is currently the standard when a trademark owner has to prove it had an earlier date of first use than what was stated in its trademark application. McCarthy § 19:52). The court explained, though, that based on current Federal Circuit precedent the burden is now on the challenger to prove invention date by clear and convincing evidence, no matter whether it has to prove that a piece of invalidating art was invented before the patent, or that the invention described in the patent was not before the invention of the invalidating art. It is true that the Patent Act presumes the validity of all issued patents and places the burden of invalidating them on the challengers. Once a challenger does so, however, it is respectfully submitted that the challenger should not have the further burden to disprove a patentee’s suggestion (based on merely enough evidence to defeat summary judgment) of an even earlier invention date, much less to prove the negative by clear and convincing evidence. Rather, once the challenger has proven, by clear and convincing evidence, the existence of anticipatory prior art earlier than the presumed date of invention (the filing date), the burden of persuasion should rest on the patentee to “swear behind” the anticipatory art. Geo. M. Martin Co. v. Alliance Machine Sys. Intl, LLC, No. C 07-00692 WHA, 2008 U.S. Dist. LEXIS 95700 (N.D. Cal. Nov. 17. 2008).